I couldn’t help writing about this spot. If I think about Rome, this place comes to my mind like an obsession, and I just love it. 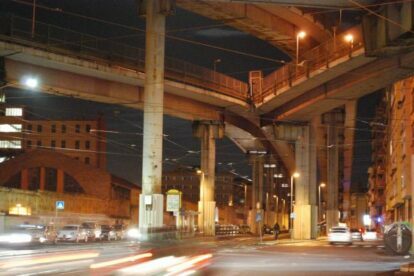 I’m not a fan of science fiction movies but the first time that I walked under Tangenziale Est’s causeways I felt like I was inside Blade Runner. It’s really fascinating. Although you can find this spot also along Via dello Scalo Di San Lorenzo, my advice is to stop at Porta Maggiore by tram or by bus and then walk along Via Prenestina towards the neighborhood of Pigneto. After the bridge you will notice the crossing point of a huge causeway. Often I prefer to walk home rather than take the bus in order to experience this place. It’s especially beautiful and surreal in the evening, after a rainy day, watching big raindrops dripping down from above. Just beside this spot there is Faloci, a famous local pastry. Another good reason to come by.